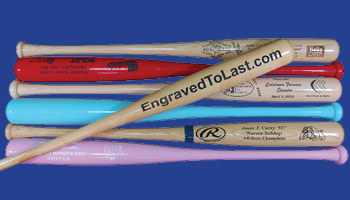 We’re America’s leading provider of Personalized “Big-Barreled” Baseball Bats for all your Gift and Award Occasions. We provide premium quality full size “Big-Barreled” Bats, larger Premium Engravings, Fast Excellent Service, and customer satisfaction based on years of dedicated, custom engraving experience. Large selection of styles and colors to choose from. Your coach will love it! Carefully crafted elements come together into one amazing design. Click on the category below for more information. We use only full sized, big barreled bats. Full sized barrels provide more room to engrave your message in large font size so you can read them “without your glasses”. We customize your bat your way. Your logo, your text, your vision. Special occasions, births, birthday, graduation, weddings, Bar Mitsvah, corporate events, and more. Every special event deserves a quality bat to mark the occasion! White ash, premium maple, Vintage 1950 Adirondacks, Vintage Louisville Sluggers, Rawlings. Custom options include your logo or one of our stock logos, custom text, colored bats, HAND painted engraving [very old school], bat racks, gift bags, and free gift cards. 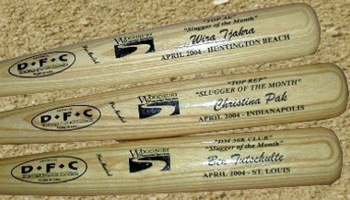 Our Company provides the ultimate in customer service to help you obtain the memory you envisioned on your custom bat. 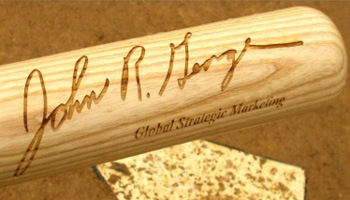 Real people to help you put your thoughts on a custom bat that will endure and be cherished through the years. Call or email us and let us live up to your expectations.